There are some things in life that are more difficult than you’d think they would be. And one of those things is keeping a clean home! Between kids, pets, and the dirt and dust of daily life, keeping your home clean may seem like an impossible task. Luckily, there’s an easy way to keep your home neat and tidy without cleaning all day long. Here’s how to Keep Your Home Clean with a Printable Cleaning Schedule! I started thinking about cleaning schedules because spring cleaning has been on my mind. I was saying to myself, if we all kept up on small and big cleaning tasks consistently througnout the year, spring cleaning would be a breeze! Think about it, if you cleaned your oven every month or so, when spring cleaning came around, it wouldn’t be some major chore. The oven would only be 30 days dirty, versus 365 days dirty! So I made this printable cleaning checklist. Hopefully if I spend the rest of this year sticking to this schedule, spring cleaning next year won’t be anything to worry about! Rome wasn’t built in a day, and a home can’t be 100% cleaned in one day either. If you’re going to keep your home clean in a manageable way, you need to break cleaning tasks up. There are a lot of different ways to do this, but one that I particularly like is a daily, weekly, and monthly system. That means there are some simple tasks you do every day, some bigger tasks that you do every week, and even bigger cleaning tasks that you do every month. This way your home is always decently clean, but you’re not overwhelmed with cleaning tasks. Here are the cleaning tasks I picked for my printable cleaning schedule! I broke each section up by room to make it easier to navigate the schedule. 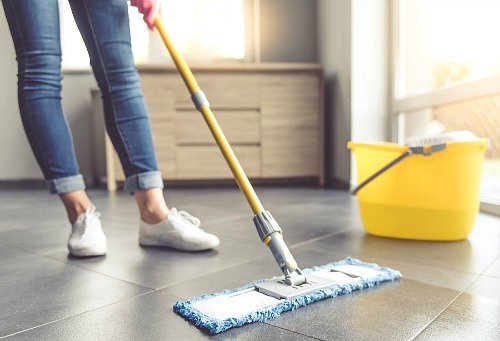 I believe a daily cleaning schedule should include enough tasks to keep your home appropriately sanitary and looking neat, but not so many tasks that you’re spending hours every day. These tasks alone won’t keep your home clean in the long run, but they can keep it from looking like a tornado hit! Obviously if you notice something looking really dirty, don’t wait until you decide to tackle your weekly/monthly tasks. 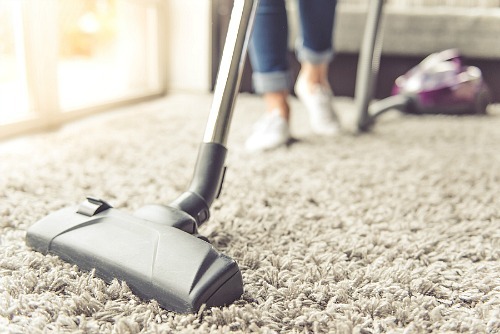 For example, some people are able to get by just fine with weekly vacuuming, but others (especially those with pets or kids) find themselves vacuuming at least once a day! I like to tackle my weekly cleaning schedule tasks all on the same day. I pick the day of the week I know I’ll have the most time. But you can split the tasks up as you have time. 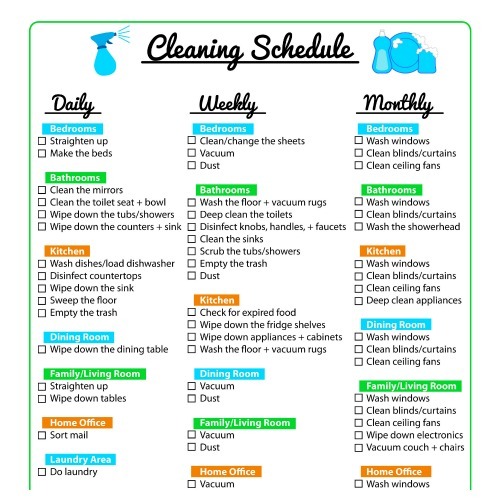 If you keep your printable cleaning schedule tacked on the fridge or filed in your home management binder, you’ll be able to easily check it as you have time. Just don’t procrastinate and wind up spending the whole weekend on tasks you could have finished earlier in the week! Lastly, the monthly part of my cleaning schedule includes the big tasks. Maybe not spring cleaning big, but still big enough. These are the kinds of tasks that you may not remember until you’re looking out the window one day thinking “Wow, when was the last time I cleaned the blinds?” The whole point of this cleaning schedule is to not let things get to the point that you’re having those kinds of thoughts! And there you have it! Listed all out like this, it sounds like too much, but do it in the frequencies specified and you’ll have a clean home without the overwhelm! Want to stay on top of all your homemaking responsibilities? Click here to get our printable floral home management binder! It contains 40+ printables (including covers and tabs)! To most effectively use this cleaning schedule in printable form, I suggest doing one of two things: #1- Use pencil. That way you can erase the daily/weekly sections as the days pass and use the same sheet for the whole month. Or #2- Put the printable cleaning schedule in a frame with glass (like I did with my DIY menu planning board). Then use a dry erase marker to mark off the tasks by writing on the glass. When you need to erase the marks, just use a rag or paper towel to wipe the marks off. You’ll never need to re-print the schedule with this method! However you choose to use your printable cleaning schedule, it’s sure to be very handy and help you keep your home clean! Want spring cleaning to be easier this year? 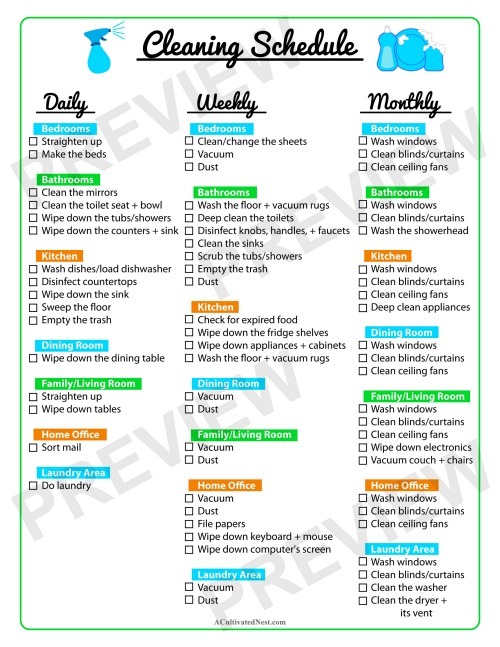 Click here to get our free printable spring cleaning checklist! Have you ever used a cleaning schedule before?